i love paint. i love what paint can do - like totally revamp your house!! or allow you to update your decor! painting artwork is major therapy for some and necessity for survival for others. paint can age. paint can brighten. and for the most part, you don't have to refinance your house to paint in it, or to pick up the hobby artistically. yes. good cheap hobbies. ty likes those too. i've been painting a lot lately. painting signs, painting a tree, painting my KITCHEN walls (holla! ), looking at painting techniques, looking at a bajillion colors and colors and colors - analyzing, thinking, researching, googling. bah! pictures of all the signs are on my facebook page here, and kitchen/living room photos will go up as soon as i'm done. soooo, don't hold your breath. hah! 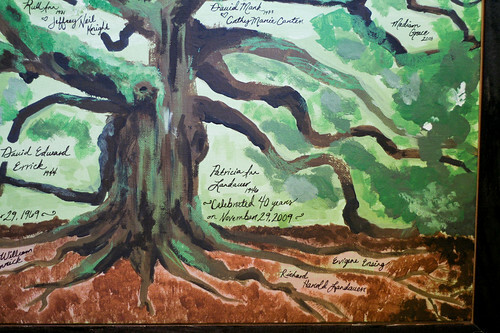 but here's a snippet of a family tree i recently painted for a wonderful lady at our church! she gave it to her parents as an anniversary gift and from what i hear, they loved it. :) enjoy. 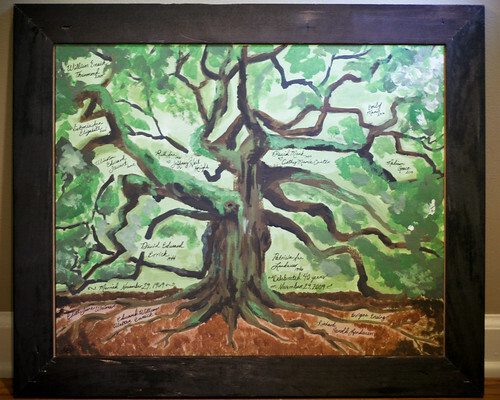 I love the family tree painting! Dr A and I just moved back into town- Abby Park, in south Hall. I've got the entire contents of an artists' supply shop in about a thousand boxes right now. LOL, Peter has graciously forgone use of the garage so I can turn it into a real studio- You're welcome to come and play with my paints. I keep a spare easel or two around, cause I love painting with friends!